Hearing impairment, as a partial decrease in the ability to detect sounds, can be the consequence of sensorineural malfunctions of the ear. Prolonged exposure to high levels of noise can cause sensorineural hearing loss especially in a noisy workplace. Noise-induced hearing loss (NIHL) as one of the most common types of sensorineural hearing loss occurs slowly, is rarely painful, and usually develops over a long period of continuous exposure to noise. Since workers do not realize, they are being affected by this occupational disease until it is too late, and the damage has become irreversible. Note that NIHL is the only type of hearing loss that is completely preventable. It is believed that sensorineural hearing loss among workers generally can be affected by several factors, including noise level, worker's age, work experience, and health-related behavior of workers such as the use of hearing protective device (HPD) and cigarette smoking, etc., In order to evaluation the effectiveness of the applied hearing conservation program, hearing thresholds of workers must be analyzed or if possible, predicted., Prediction models are used in a variety of medical domains for diagnostic and prognostic tasks, and they are frequently built from experience which constitutes data acquired from actual cases. In previous studies, the relationship between rates of sensorineural hearing loss and noise exposure level along with covariate risk factors have been analyzed using the multivariate regression in industrial workplaces.,, Joshi et al. reported chance of sensorineural hearing loss for the noise-exposed workers was 4 times. Chang and Chang also estimated the effects of noise exposure, predisposing characteristics, employment-related factors, and personal habits to induce sensorineural hearing loss using logistic regression. Despite the use of classical statistical approaches to investigate the influencing factors on the risk of hearing loss, accurate prediction of the grades of hearing impairment among industrial workers using new approaches has been not performed. Machine learning methods are assigned as alternative statistical techniques for prediction of complex phenomena that already have been widely used in basic science, medicine, and engineering. Currently, this approach is recognized as a new method for modeling of various sciences, accurately. Artificial neural networks (ANNs) are common method for supervised machine learning and classification. Artificial neural networks can be called electronic models of human brains neural structure, which have an innate talent to store and apply empirical data. The ability to determine the complex relations among different variables and the capacity of using multiple learning algorithms are known as its features. ANNs in recent years proved to be the best classification tool., Song et al. performed a comparative analysis of logistic regression and ANNs for computer-aided diagnosis of breast masses. The result stated that ANNs had higher specificity compared with logistic regression value. Comparison of the mentioned models for prediction of mortality in head trauma showed neural networks significantly outperformed the logistic models in both fields of discrimination and calibration but lagged behind in accuracy. Multinomial logistic regression has been applied in many medical data classification tasks. Sadat-Hashemi et al. showed when the relations among variables are complex, neural networks can use instead of multinomial logistic regression to predict the nominal response variables with several levels in order to gain more accurate predictions. During the last decades, machine learning methods have offered an interesting opportunity for analyzing the nonlinear and vague information located in the complex phenomena of the actual world. However, a few studies dealing with the prediction of occupational diseases have reported using machine learning methods , and they have not yet been employed for prediction of hearing loss. This study aimed to empirically analyze the potential of ANNs and multinomial logistic regression techniques for predicting the grades of hearing impairment among industrial workers. This historical cohort study was carried out in a steel factory located in West of Iran in May 2013. The study population were all the male workers employed in the noisy parts (n = 240). Based on the exclusion criteria, some workers were excluded (n = 30). Therefore, 210 noise-exposed male employees were considered from different workstations of factory as the study population. To select the final variables of the model for estimation the grade of hearing loss, the following steps were conducted. A questionnaire was completed mainly by interview and study of workers' periodic medical examinations records, to obtain individual characteristics, and identify the occupational risk factors, and know the pattern of behaviors including smoking and using status of HPD. Workers with the certain medication, coexposure to solvents, ear infection and pain or discomfort in the ear, diabetes mellitus, ear surgery, exposure to nonoccupational noise (such as participation in war, etc. ), noise exposure in previous jobs, unilateral or conductive hearing loss or any kind of hearing loss with a known etiology were excluded from the study. To determine the sensorineural hearing loss threshold of workers, audiometric test was carried out using an Interacoustics audiometer model AC 40 (EN 60645-1, ANSI S3.6, Type 1), which was calibrated according to international standards (IEC 60645-1; ISO 389-1). An audiometer chamber was used, with a background sound pressure level not exceeding the maximum octave-band levels for audiometric test rooms based on ISO 8253-1. Note that, for determining the workers' permanent hearing loss (Baseline audiogram), audiometric tests were performed at least 14 h after workers had accomplished their occupational activities. The World Health Organization (WHO) recommended a grading system for hearing loss on the basis of the pure tone audiogram taking the average of the thresholds of hearing for frequencies of 500, 1000, 2000 and 4000 Hz. In this way, the extent of hearing loss is assessed using the grading system proposed by the WHO (1986): Less than 25 dB (normal), 25–40 dB (slight), 41–60 dB (moderate), 61–80 dB (severe), and above 80 dB (extreme). Personal noise exposure was measured using a noise dosimeter, TES 1354, in the workstations of workers according to ISO 9612. Before measurement, the noise dosimeter was calibrated using a standard calibrator. The main risk factors for sensorineural hearing loss were identified based on ISO 1999 method and the scientific literature about NIHL. To process and select the final features of the prediction model, such statistical methods as correlation matrix were used. Based on the method the input features with high significant correlation with output feature (sensorineural hearing), were selected. Five features including the age of workers (input 1), work experience (input 2), noise exposure level (input 3), smoking status (input 4), and using status of HPD (input 5) were determined as the final variables to develop the prediction model. The smoking status, as a qualitative variable, was classified into two groups; smokers and nonsmokers. The using status of HPD by workers was also classified into three categories; continuous usage, intermittent usage, and not used. Artificial neural networks consist of a number of interconnected neurons which are positioned in at least three layers, that is, one input layer of source neurons, at least one hidden layer and an output layer of computational neurons. Each neuron in the hidden layer of the networks can generally be considered as a simple processing element taking one or more input(s) and giving one and more output(s). In each neuron, a related weight is assigned to an input through which the power of each input is adjusted. The neuron can, thereby, combine all the inputs and calculate an output, which is passed on. Nonlinearity can be considered as the main activation function of neural networks, the most typical of which is the sigmoid function used as an activating one. Multilayer perceptron, used in the present study, can be regarded as the most widely accepted structure of neural networks, applied to model physical phenomena. Regarding the interconnections within the neural networks structure, feed forward networks, were selected. In current study, training ANNs was performed based on the supervised learning method using error back-propagation learning algorithm. In this study, 70% of data was randomly used for training the networks, and 30% was used for testing of the neural networks. Training the networks was continued until the number of a certain epoch (100) was passed, or the error variations of networks prediction in a mentioned epoch were minimized. The neural networks model for predicting the grade of hearing loss was trained and tested using MATLAB software (The MathWorks Inc. USA). Different structures of neural networks with one hidden layer were developed, and the best networks were chosen using trial and error in terms of the number of neurons. In this way, neural networks have one hidden layer with the number of neurons being approximately between 5 and 15 neurons. To compare the performance of the developed models to predict the grades of hearing loss, the area under the receiver operating characteristics (ROC) curve, Cohen's kappa coefficient, and accuracy rate were used. ROC curve is the sensitivity according to one minus the specificity and the area under the curve is between 0 and 1 that can be used as a criterion for evaluating the performance of the models. Whatever that value is closer to one, the ability of the prediction model is greater. Cohen's kappa measures the agreement between two methods which each classifies N items into C mutually exclusive categories. If the methods are in complete agreement then κ =1. If there is no agreement among the raters other than what would be expected by chance κ =0. Moreover, the overall accuracy ([true positive + true negative]/total) of the final model was determined by comparing the predicted values with the actual events. Descriptive statistics of the quantitative input variables for developing prediction models is shown in [Table 1]. The results showed that the noise exposure levels in the steel factory during the whole working shift period is equal to 88.3 ± 3 dB (A). This indicates that compared with the national exposure limit (85 dB (A) for 8 h/day), almost all workers were continuously exposed to high noise levels. The descriptive results showed that 29% of workers are smokers. Moreover, from the standpoint of HPD usage, 60% of workers use those continuously, and 28.5% of them use irregularly. Furthermore, 11.5% of workers do not use HPDs. Based on the WHO classification for the grades of hearing loss, 74.2% of the studied workers have normal hearing thresholds, 23.4% have slight hearing loss, and 2.4% have moderate hearing loss. Results of prediction performance of the developed models for prediction of the grades of hearing loss in the train and the test phases are shown in [Table 2]. The results showed that networks structure with one hidden layer and ten neurons exhibited the highest level of accuracy. Prediction error of ANNs was in the acceptable level based on performance criteria in predicting unseen data (test phase). Prediction error in the training phase was also lower than the test phase. The results also evinced that ANNs were more accurate than multinomial regression in hearing loss prediction. To compare the performance of the developed models to predict the grades of hearing loss (Class 1: Normal, Class 2: Slight, Class 3: Moderate), (ROC) curves were also plotted. As mentioned that the higher ROC areas indicating the better performance of the models. ROC curves for the test phases of developing ANN and multinomial logistic regression models were shown in [Figure 1] and [Figure 2]. The results confirmed that the areas under the ROC curves were significantly greater for the ANN than logistic regression. 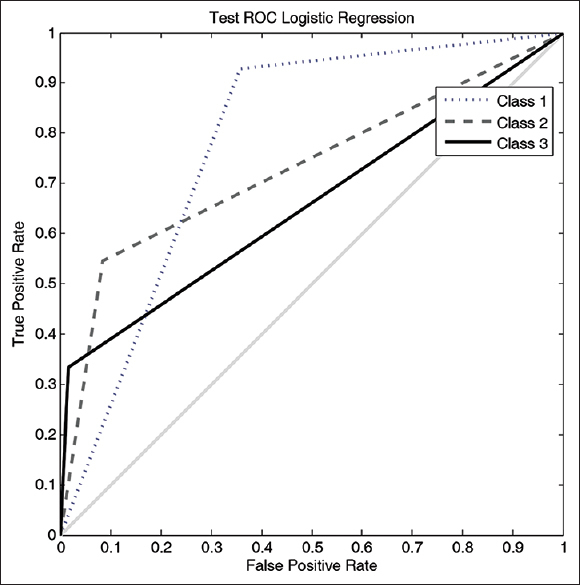 In the logistic regression model, areas under the ROC curve of for Class 2 and 3 were not representing good results. These errors can be due to low sample size in the mentioned classes. However, in the ANN model, areas under the ROC curves for Class 2 and 3 were excellent. Prediction of the grades of hearing loss of workers is considered as an important aspect of hearing conservation program in the noisy environments. For health experts, empirical models are more practical and quicker methods than other models. 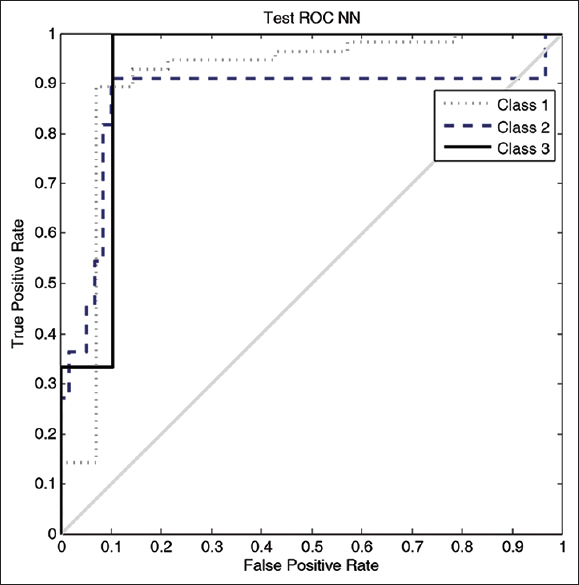 In this study, neural networks were used as an empirical model to predict the grades of hearing loss compared with multinomial logistic regression. The results indicated that feed forward, multilayer neural networks could accurately predict the grades of hearing loss of workers in typical noisy environments. Shi et al. also showed in comparison with the conventional logistic regression model, the ANN model was more accurate in predicting in-hospital mortality and had higher overall performance indices. For logistic regression, the popularity can be related to the interpretability of model parameters; for ANNs, this can be due to the fact that these models can be seen as nonlinear generalizations of logistic regression, and thus at least as powerful as that model. In the literature, the use of neural networks for prediction of hearing loss is restricted to a few studies about dealing with the estimation of hearing loss induced from otoacoustic pollutants. De Waal et al. used feed-forward ANNs with a back propagation training algorithm for predicting hearing loss induced from otoacoustic pollutants. They showed the prediction accuracy of normal hearing more than 88%. The result of our study confirmed that neural networks could be a suitable tool for analysis of a phenomenon such as hearing loss in where required data for different variables are being collected while the mechanisms of interaction effects are complex and not fully understandable. To attain the networks with optimal performance, structural, activation function and learning algorithms were chosen in accordance with the nature of the phenomenon of study. In addition, the best networks were chosen using trial and error in terms of the number of neurons. The results also confirmed that one layer of hidden neurons is sufficient for classifying most data sets. However, the number of neurons in the hidden layer should be select empirically. In real situations, there are many other variables that can influence the hearing loss; however, all of them cannot be incorporated in the model. Note that the level of details of input variables should be in accordance with the desired value of the accuracy of results. The results of ROC curves showed the robust performance of neural networks in dealing with noisy or incomplete data and have the ability to generalize from the input data. It seems that this method can be better suited than other modeling methods for prediction of outcomes when the relationships between the variables are complex, multidimensional, and nonlinear as found in complex occupational diseases. The observed limitations related to the ANNs were included need to user skill, spending long time for development of model structure and trial and error functions for improvement of prediction model. It is worth mentioning that some of the workers have moderate hearing loss, which is an indication of an essential need for analyzing the effectiveness of existing HCPs. The results confirmed that irregular use of HPDs by workers exposed to high noise level has intensified the risk of NIHL. Davies et al. also showed that by regular and continuous use of HPDs, the relative risk of appearing changes in hearing threshold was reduced by 30%. On the other hands, Pouryaghoub et al. reported that 49.5% of smoker workers had a mean hearing threshold loss >30 dB, whereas it was 11.2% for nonsmokers. In addition, the training of workers who work in the noisy parts of the steel factory is required to make sure of noise hazards awareness of workers. Training as an administrative control can provide awareness and attitudes for the effective use of hearing protection, continuously. In this way, the developed model can be considered as practical tools for occupational health and medicine professionals in order to analyze occupational hearing status records. Empirical prediction of the grades of hearing loss can help for implementation of an effective hearing conservation program in noisy environments. Since occupational hearing loss is usually noncurable, the results of prediction can help experts to modify and improve programs. The results confirmed that neural networks could provide more accurate predictions than logistic regression. The authors would like to thank manager and workers of the steel factory for their cooperation. Jansen EJ, Helleman HW, Dreschler WA, de Laat JA. Noise induced hearing loss and other hearing complaints among musicians of symphony orchestras. Int Arch Occup Environ Health 2009;82:153-64. Sung JH, Sim CS, Lee CR, Yoo CI, Lee H, Kim Y, et al. Relationship of cigarette smoking and hearing loss in workers exposed to occupational noise. Ann Occup Environ Med 2013;25:8. Pouryaghoub G, Mehrdad R, Mohammadi S. Interaction of smoking and occupational noise exposure on hearing loss: A cross-sectional study. BMC Public Health 2007;7:137. Neitzel R, Seixas N. The effectiveness of hearing protection among construction workers. J Occup Environ Hyg 2005;2:227-38. Adera T, Amir C, Anderson L. Time trends analysis of hearing loss: An alternative approach to evaluating hearing loss prevention programs. AIHAJ 2000;61:161-5. Lindgren T, Wieslander G, Nordquist T, Dammström BG, Norbäck D. Hearing status among cabin crew in a Swedish commercial airline company. Int Arch Occup Environ Health 2009;82:887-92. Guerra MR, Lourenço PM, Bustamante-Teixeira MT, Alves MJ. Prevalence of noise-induced hearing loss in metallurgical company. Rev Saude Publica 2005;39:238-44. Rabinowitz PM, Galusha D, Dixon-Ernst C, Slade MD, Cullen MR. Do ambient noise exposure levels predict hearing loss in a modern industrial cohort? Occup Environ Med 2007;64:53-9. Davies H, Marion S, Teschke K. The impact of hearing conservation programs on incidence of noise-induced hearing loss in Canadian workers. Am J Ind Med 2008;51:923-31. Joshi SK, Devkota S, Chamling S, Shrestha S. Environmental noise induced hearing loss in Nepal. Kathmandu Univ Med J (KUMJ) 2003;1:177-83. Chang SJ, Chang CK. Prevalence and risk factors of noise-induced hearing loss among liquefied petroleum gas (LPG) cylinder infusion workers in Taiwan. Ind Health 2009;47:603-10. Basheer IA, Hajmeer M. Artificial neural networks: Fundamentals, computing, design, and application. J Microbiol Methods 2000;43:3-31. Byvatov E, Fechner U, Sadowski J, Schneider G. Comparison of support vector machine and artificial neural network systems for drug/nondrug classification. J Chem Inf Comput Sci 2003;43:1882-9. Kolarzyka E, Stepniewskib M, Mendykc A, Kitlinskid M, Pietrzyckab A. The usefulness of artificial neural networks in the evaluation of pulmonary efficiency and antioxidant capacity of welders. Int Arch Occup Environ Health 2006;29:385-92. Singla R, Chambayi B, Khosla A, Santosh J. Comparison of SVM and ANN for classification of eye events in EEG. J Biomed Sci Eng 2011;4:62-9. Song JH, Venkatesh SS, Conant EA, Arger PH, Sehgal CM. Comparative analysis of logistic regression and artificial neural network for computer-aided diagnosis of breast masses. Acad Radiol 2005;12:487-95. Eftekhar B, Mohammad K, Ardebili HE, Ghodsi M, Ketabchi E. Comparison of artificial neural network and logistic regression models for prediction of mortality in head trauma based on initial clinical data. BMC Med Inform Decis Mak 2005;5:3. Sadat-Hashemi M, Kazemnejad A, Lucas C, Badie K. Predicting the type of pregnancy using artificial neural networks and multinomial logistic regression: A comparison study. Neural Comput Appl 2005;14:198-202. Farhadian M, Mahjub H, Aliabadi M, Musavi S, Jalali M. Prediction of workers pulmonary disorder exposed to silica dust in stone crushing workshops using logistic regression and artificial neural networks techniques. Jundishapur J Health Sci 2013;5:141-8. Liu H, Tang Z, Yang Y, Weng D, Sun G, Duan Z, et al. Identification and classification of high risk groups for Coal Workers' Pneumoconiosis using an artificial neural network based on occupational histories: A retrospective cohort study. BMC Public Health 2009;9:366. Rosso M, Agius R, Calleja N. Development and validation of a screening questionnaire for noise-induced hearing loss. Occup Med (Lond) 2011;61:416-21. ISO 389-1. Acoustics – Reference Zero for the Calibration of Audiometric Equipment – Part 1: Reference equivalent threshold sound pressure levels for pure tones and supra-aural earphones. Geneva: International Standard Organization; 2000. ISO 8253-1. Acoustics – Audiometric test Methods – Part 1: Basic Pure Tone Air and Bone Conduction Threshold Audiometry. Geneva: International Standard Organization; 1989. ISO 6189. Acoustics – Pure tone Air Conduction Threshold Audiometry for Hearing Conservation Purposes. Geneva: International Standard Organization; 1983.
WHO. Prevention of deafness and hearing impairment. Thirty-ninth world health assembly. Annex A 39/14. Geneva: World Health Organization; 1986. ISO 9612. Acoustics – Determination of Occupational Noise Exposure Engineering Method. 2nd ed. Geneva: International Standard Organization; 2009. Black J, Benke G, Smith K, Fritschi L. Artificial neural networks and job-specific modules to assess occupational exposure. Ann Occup Hyg 2004;48:595-600. Demuth H, Beale M. Neural Network Toolbox User's Guide for Use with MATLAB. Natick: Math Works, Inc.; 2002. Dreiseitl S, Ohno-Machado L. Logistic regression and artificial neural network classification models: A methodology review. J Biomed Inform 2002;35:352-9. Shi HY, Lee KT, Lee HH, Ho WH, Sun DP, Wang JJ, et al. Comparison of artificial neural network and logistic regression models for predicting in-hospital mortality after primary liver cancer surgery. PLoS One 2012;7:e35781. De Waal R, Hugo R, Soer M, Krüger JJ. Predicting hearing loss from otoacoustic emissions using an artificial neural network. S Afr J Commun Disord 2002;49:28-39. Tu JV. Advantages and disadvantages of using artificial neural networks versus logistic regression for predicting medical outcomes. J Clin Epidemiol 1996;49:1225-31.